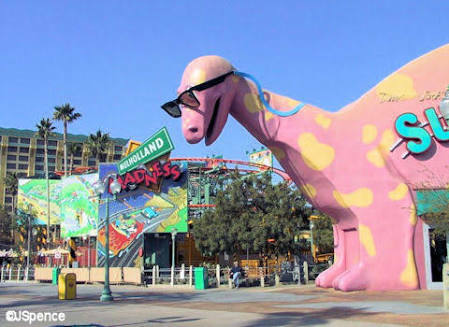 While many fear change, the mantra of California Adventure would have to be, ” Change is Good.” Since opening in Februrary 2001, California Adventure has seen more change than a toddler’s mood before bedtime. In fact, at least five opening day attractions, along with the gaudy billboard style scenery, were given the flick within the first 10 years. This is by no means a bad situation, as what we are left with is a park, now worthy of the Disney name. Situated 100 metres across the concourse from Disneyland, California Adventure, while smaller, still has plenty to offer, especially for guests over 12. It consists of seven themed areas that even now, are undergoing change. 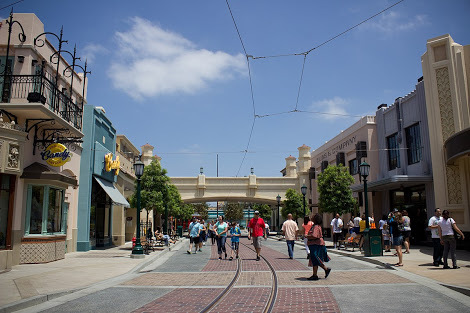 Buena Vista Street is the “Main Street USA” of California Adventure. Upon entering this park you are greeted by beautiful 1920s style buildings, resembling LA as Walt would have seen it when he first arrived. Among the red trolley buses and newspaper boy chorus, you will find a good array of shops and restaurants, all highlighting the glory days of pre-depression LA. A taste of LA in the 1920s on Buena Vista Street. Reflective of the beautiful redwood forests and mountainous regions of California, Grizzly Peak is among the most spectacular lands at the entire resort. 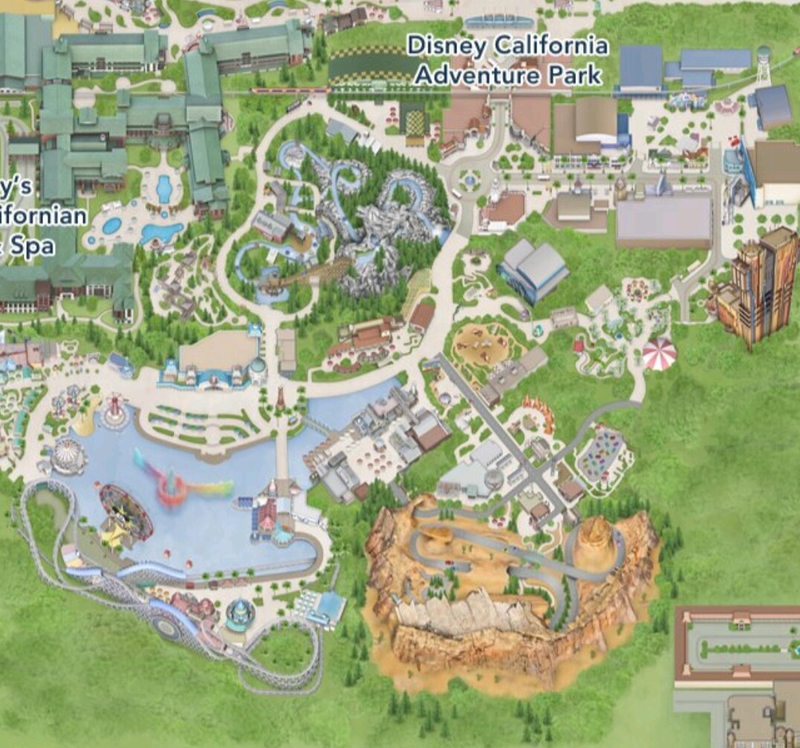 Despite the changes to California Adventure over the years, this area remains relatively untouched, with the Grizzly River Run and Soarin’ the two featured attractions. Both of these rides are world class and genuinely perfect for all ages. 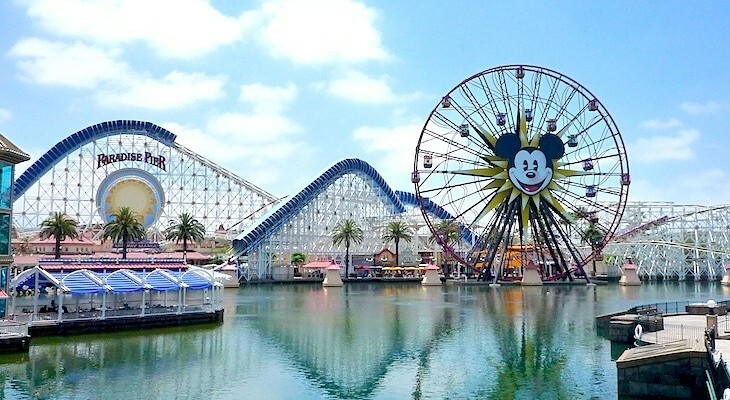 Based on the classic ocean boardwalk carnivals, Paradise Pier is the largest area in California Adventure and is set on a large lake, where a brilliant water and light shows takes place every night. 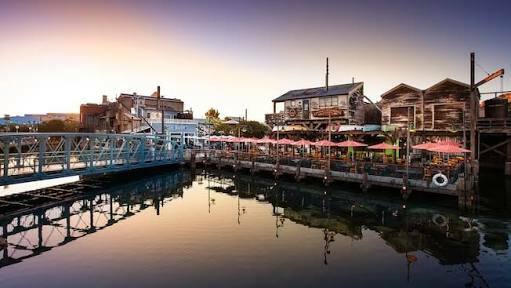 On the northern side of the pier you will find a number of family attractions, including The Little Mermaid Ride and Goofy’s Sky School Coaster, while the Western side features a Mexican Fiesta Village. While the entire Northern and Western sides of the pier will remain unchanged the Southern side has recently begun a five month overhaul to become Pixar Pier. Aside from an additional ride or two this upgrade will only see the permanent installation of Pixar themed overlays. For example, what once was the California Screaming Roller Coaster, will become the Incredicoaster, while Mickey’s Fun Wheel will have Pixar character gondolas. Regardless of the changes, Paradise Pier is a great area full of things to do, featuring the best coaster in Disneyland and some solid family attractions. 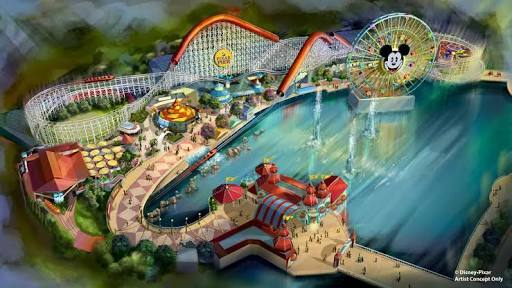 Some concept art showing some of the mostly cosmetic changes to Paradise Pier. From the biggest land to the smallest, Pacific Wharf is snuggled between Paradise Pier and Carsland. If you have ever been to lunch on a marina then this is what the area generally entails. It has a few little cafes and a bakery, in which you can have a tour. However, unless you are eating here you will spend little to no time. 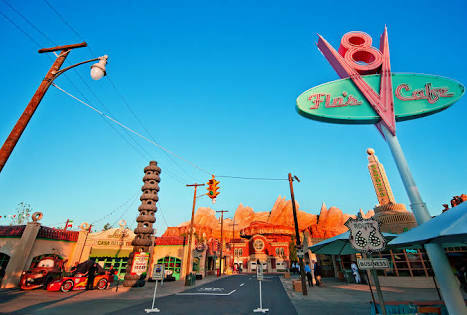 Carsland was opened in 2012 and is the closest thing to an immersive experience as you can get at Disneyland Resort (Until Star Wars Galaxy’s Edge opens). It is literally a full scale replica of the Radiator Springs township, right down to the last bit of bitumen. From Mater’s Junkyard Jamboree to the stunningly awesome, and very popular, Radiator Springs Racers, every element of this land is amazing. It is great for everyone and if you are there during Halloween or Christmas the theming gets even better. Definitely a must! A view half way down Radiator Springs and yes the canyon is real and home to a terrific attraction! Hollywood Land is considered one of the more quiet areas of California Adventure. Much like Buena Vista Street it is supposed to encapsulate the glory days of Hollywood but lacks the charm of its updated counterpart. Attractions include the Monsters Inc ride, animation workshops and Guardians of the Galaxy Mission Breakout (Formerly the Hollywood Tower of Terror). This is also the land you can see some of your favourite Superheroes. As mentioned earlier, rumours continue, to float around that Marvel Land is on its way and is set to take over Hollywood Land. The first major sign of this was the conversion of the Hollywood Tower to Guardians of the Galaxy but watch this space for more info as the rumours continue to develop into fact. While California Adventure will always be overshadowed by Disneyland, its role as support park cannot be understated. It has fantastic attractions that in some cases rivals those of its big brother, along with great theming throughout most of the park. You could easily spend a good two days here alone.